View More In Keyboard Cases - Page 2. 1.The Bluetooth keyboard is ultra slim and light weight to portable. 2.Build in groove design for Adjustable smart stand provides that perfect angle for productivity and video viewing weather you're watching or typing. 3.Real "hard" laptop style keyboard with high end ABS material. 4.Detachable keyboard compatible with all iOS, Android, Apple & Windows devices. 5.Magnetic cover keeps keyboard from dropping. Steady, secure and protective. 6.Durable,Scratch proof, Daily water resistant. 7.Auto sleep/wake maximizes battery life. 8.Available in a variety of bright, fun colors. 9.Perfect for School Class, Meeting, Travel, Business Trip and wherever you go. STONG COMPATIBILITY - Compatible for New iPad 9.7 2018/2017, iPad Pro 9.7, iPad Air 1 and iPad Air 2. Fashion, Slim and lightweight keyboard case to portable. ADJUSTABLE VIEWING ANGLE - Built-in multiple slots able to set up multiple horizontal stand angles for comfortable facetime watching typing. You can easily adjust the viewing angle to any level. Perfect for working, writing or watching videos at business, school, travel and home. FULL PROTECTION - Premium composition pu fabric exterior and anti-slip honeycomb plastic interior offer great protection against daily use. Waterproof, Durable and Classical. LONGEST BATTERY LIFE - Rechargeable lithium battery with an industry-high capacity lasts for 6 months between charges (based on 2 hours of use per day). Greatly power saving for your device. 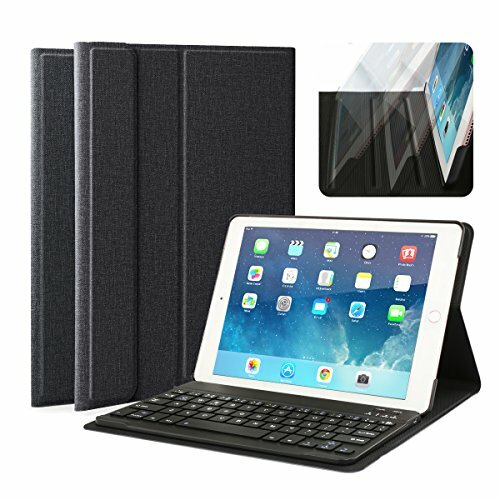 BEST WARRANTY - Premium quality of our iPad keyboard with case give you worry-free purchase. CoastaCloud Provide lifetime warranty and superb customer service. If you have any questions about this product by CoastaCloud, contact us by completing and submitting the form below. If you are looking for a specif part number, please include it with your message.